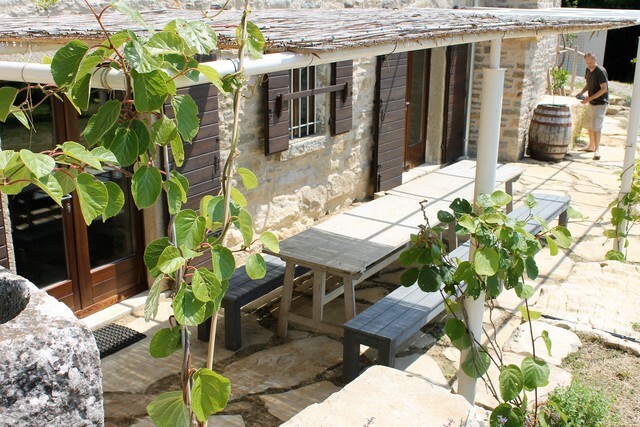 Bolara 60 is a destination for those seeking rural tranquility and culinary adventure. We invite guests to soak up the surrounding greenery, explore the hilltop villages, walking routes, wineries and traditional restaurants of inland Istria, and join us for dinner, one of our culinary activities or perhaps in the vegetable garden! A stay at Bolara 60 includes accommodation in one of our individually furnished rooms in the Kuća (main house), with breakfast served communally each day; or the whole use of the Kućica (small house, attached), which is self-catering. Either way you’ll be able to book in for dinners or culinary activities (subject to Anna’s availability). We encourage you to explore Istria, or simply relax and enjoy the abundance of animals, birds, wild flowers, and butterflies (and many other bugs for the entomologists among us) that can be found all around us. Getting here is easy. Click here for a map and information on nearest airports and travel in the region. The Kuća (“house” in Croatian) has 4 beautiful guest bedrooms available for bed & breakfast bookings. The Kuća is alongside the Kućica – click the button below for more information and images. The Kućica (“small house”) is a self-contained 2-bedroom house with its own kitchen/living area and covered terrace, next to the main house – click the button below for more information and images. 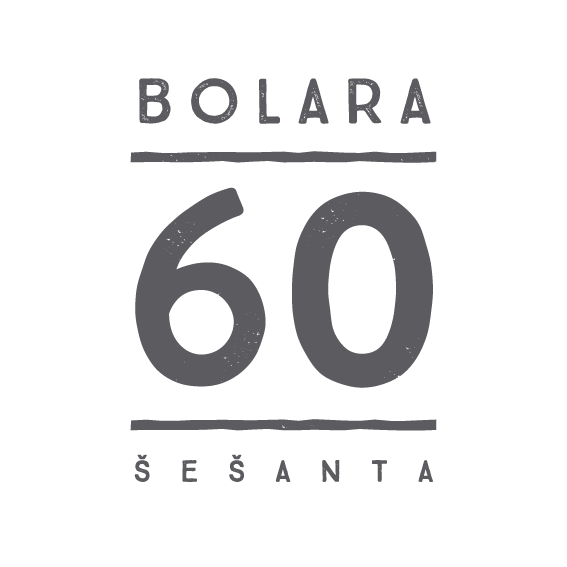 Bolara 60 is available for private group bookings for up to 14 people hiring all 4 rooms in the main house plus 2 further rooms in the Kućica. 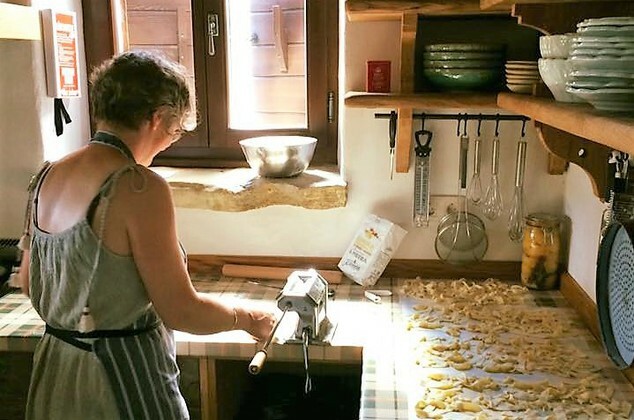 For such large group bookings we are able to arrange a bespoke schedule of cooking classes and activities according to your preferences (dependent on seasonal availability). Email us to discuss prices and availability for a group booking at anna – at – bolara60 – dot – com. We have several communal areas at Bolara 60 where guests are welcome to relax and where we hold our cooking classes and dinners. 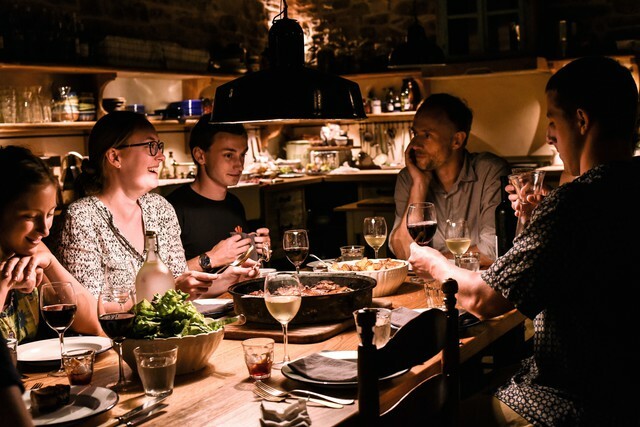 The large open-plan stone-walled “konoba”- formerly the cow-shed – features a long oak dining table, kitchen and two large traditional fireplaces for grilling, roasting, baking and getting cosy in colder months. The room is dug into the hillside and opens out to a large southwest-facing terrace at the back of the main house with lovely views across the Mirna valley. In warmer months we do most cooking in the “ljetna kuhinja” or summer kitchen, the small building alongside the main house. This contains our teaching area, fully equipped kitchen, covered terrace and sizeable larder! In the open courtyard area between the main building, summer kitchen and vegetable garden you will find a wood-fired pizza oven, charcoal grill and large stone table for communal cooking and dining. The Kućica has its own indoor kitchen and outdoor grill on its own terrace for guests of the Kućica to use. Our large walled vegetable garden and a small orchard allow us to grow and harvest produce for our dinners. Guests are very welcome to lend a hand weeding and picking! We also have a small olive grove so we can cure our own eating olives, and chickens for daily fresh eggs of superb quality. Take a look at the cooking classes and dinners we offer. As well as the meadows and gardens, Bolara 60 has its own small patch of forest that guests are free to explore. The usually dry rocky stream bed down into the valley is particularly pretty, and full of wild asparagus in springtime (once you learn how to recognize it!). There are also several walks to try directly from Bolara, including a 45 minute walk up through olive groves and forest to the ridiculously pretty medieval “town” of Grožnjan; from there you can also access the Parenzana – a beautiful walking and cycling route which winds its way through the hills, once the Austro-Hungarian railway between Trieste and Poreč. Our neighbours run a working farm growing olives and grapes to make their own delicious olive oil and wine, both of which you can try, and buy, directly from them. 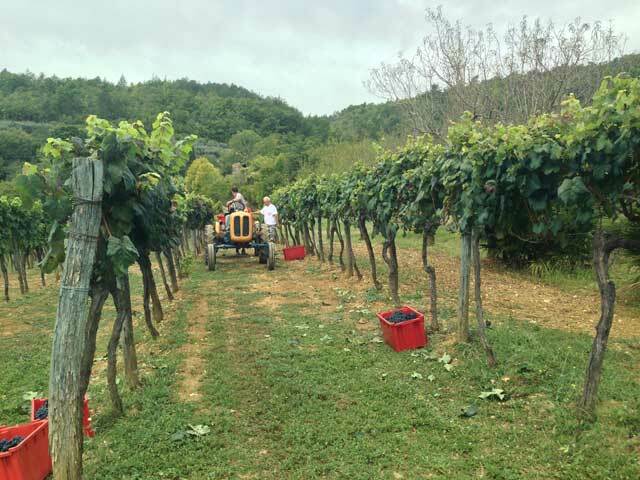 And you may even be able to join in with the grape harvest (September) or olive harvest (late October-November) if timing and weather permit. Like many other small farms here, they also keep chickens, and dogs for truffle hunting. 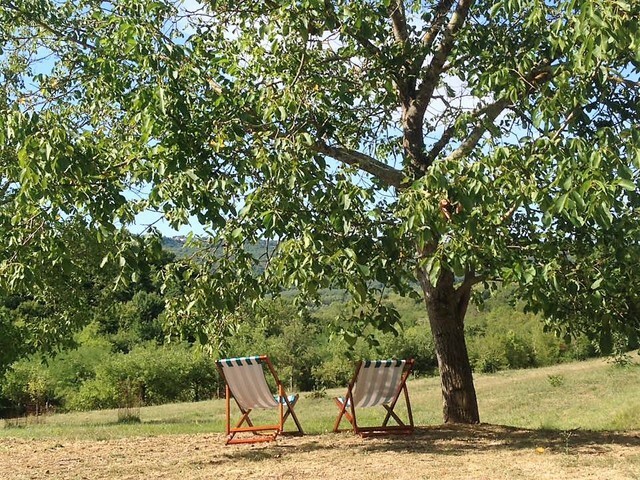 There are amazing things to do all year round at Bolara 60 and around Istria – take a look at our gallery.